The importance of Rocky Bridges. Jeff Banister, well over an hour into his allotted 30 minutes, pointed at one of the 300 seated coaches and asked him to name the coach who had the greatest impact on him when he was a kid, and why. Banister pointed at another coach and asked the same two questions. He went through the exercise maybe 10 times, and challenged the room to think about the legacy left with every word, every act. Banister’s own answer to his first question: Rocky Bridges. I’ve gotta confess: Rocky Who? I scribbled the name down to Google later. If you were at Rangers Ballpark for the Coaches’ Clinic that Sunday morning a week and a half ago, or the Awards Dinner two nights earlier, or Fan Fest in between, and got the chance to be around Jeff Banister for any amount of time at all, you’ve experienced the unmistakable presence, the command of the room, the posture and the pitch, all the things that add up to the epitome of Coach. There’s a charisma that, in the delivery, won’t remind you of Ernie Banks — who we lost that weekend — but like it was with Banks, it takes about three minutes around Banister for you to start scrambling around looking for the eye black, and a wall to run through. I have no doubt what Banister’s stance is on playing two. You think about all the influences Banister must have had in his life in pro ball, which will enter its 30th year when Pitchers & Catchers report 16 sleeps from now, not to mention the Little League and high school and college coaches before that, including his Dad Bob, a high school football and basketball coach in La Marque. Banister was managed by Jim Leyland. Mentored by Chuck Tanner. Groomed by Clint Hurdle. But Rocky Bridges was the one, even though that Google search seemed to establish that Bridges, who played pro ball for 15 years and managed in the minor leagues for 21, was never once with a club that Banister suited up for himself. In one sense there’s more Banks in Banister than there is Bridges, in that Banister spent 29 years with the same franchise, an anomaly that calls to mind names like Banks, and Brett, and Bench, while Bridges was employed by seven different clubs as a player, and then four different organizations as a manager, three of which he’d never played for. Bridges’s final stop was the Pirates, whose Prince William and Vancouver and Buffalo and Salem farm clubs he managed in the late ’80s, but in those same four seasons Banister was in Watertown and Macon and twice in Harrisburg. No apparent overlap between Banister and the man he credits with making the greatest impact on his baseball life. The 21st and final team Bridges managed was the 1989 Salem Buccaneers of the High Class A Carolina League, which was one level below the AA Harrisburg club that Banister played for. They presumably spent time around each other in more than one spring training in Bradenton, but that’s not when the connection was made. Bridges, you might discover by digging enough, hung around the Pittsburgh organization for a few years after he was done managing, serving as its roving minor league infield instructor. He remained in that role in 1994, when a freshly retired Banister, only 30 years of age, was appointed to manage the Welland Pirates of the Short-Season A New York-Penn League. As it turns out, Bridges, spent a great deal of that summer — his last of 48 in the pro game as far as I can tell — as Banister’s de facto bench coach, a 67-year-old lifer shepherding a survivor less than half his age. A native of Refugio, Texas mentoring a native of La Marque, 1600 miles away in Ontario, Canada. Equal parts old school baseball man and one-liner machine, Bridges has been credited by Leyland (in a story by MLB.com’s Tracy Ringolsby) as “one of those guys who had a reputation more for being a character than [for] his baseball knowledge. But he knew the game. He was sharp as a tack. When I asked him about a player, I could go to the bank with his answer.” Ringolsby described Bridges “a minor league cross between Casey Stengel, Don Zimmer, and Yogi Berra,” which is about a thousand-word description on its own. Banister describes him as more than that. Slow your roll, in other words. Sit back down. Let the players play. Observe. Give them your passion, give them your integrity. But your job isn’t to holler at them from the dugout. Bridges, Banister suggests, had as keen an eye on how to read a person as anyone he’s come across in baseball, or otherwise. If you were able to look past the indestructible balloon of chaw that evacuated only to make room for a cigar, the irreversibly arthritic limp, the broken and gnarled fingers out of which he would still throw BP, you found a man with a passion for the game reminiscent of Banks, and a gift for impacting it from the trenches that resonated heavily with Banister. Last week — four days after Banks passed away, and two days after Banister captivated a room of 300 local baseball coaches — Everett Lamar “Rocky” Bridges died. He was 87. The obituaries — as well as a story linked inside this outstanding tribute by the great Jay Jaffe — say Bridges died of natural causes. I have no idea whether his death was expected for some period of time, and if so whether Banister was aware of his condition when he spoke so reverently of the man on that Sunday morning at 1000 Ballpark Way. Banister held the room that morning the way I imagine Bridges had him hanging on every word 21 years ago over a summer in Welland and Hudson Valley, Batavia and Utica, Oneonta and Williamsport. I could list a couple dozen inspiring things Banister said two Sundays ago and I imagine, little by little, I will. A whole lot of people who were in that room will probably remember a lot of what Banister said 21 years from now. Based on nothing but that hour, I can’t wait to see what sort of impact Banister has on Rougned and Neftali, on Martin and Delino, on Jorge and Joey, on Chi Chi and Elvis and Tanner and Jake, on Leonys and Keone, on Prince and Derek and Boo and Jayce, passing on a legacy as he builds further on his own. One of the things Banister urged the room of 300 was to be the kind of coach you wish you had at age 10. 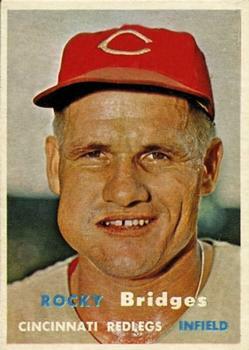 Ten days ago I didn’t know a thing about Rocky Bridges, who had 2,272 undistinguished big league at-bats. Ten months ago I didn’t know much more about Jeff Banister, who had 2,271 fewer big league at-bats. But I have a good idea now that Banister intends to be the kind of coach he had by his side when he was age 30. That day when Banister next holds the room, this time in front of his new baseball team at 15960 N. Bullard in Surprise, influenced and inspired and mentored by many, but none more impactfully than Rocky Bridges, can’t come soon enough.